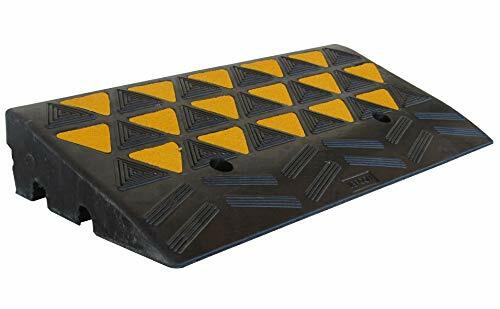 The ramps are made from recycled rubber and placed on pavements with 3.9" height (10cm) in order to bridge the difference in height with the road and to ensure easy movement of vehicles. Modular ramps can be used singularly or connected together to create an extended ramp of any length. Available in bright colors to make their presence known to pedestrians and drivers. Perfect solution for hand trolleys, golf carts, motorcycles and boats. Dimensions 11.8"L x 23.6"W x 3.9"H (30cm x 60cm x 10cm). Brand new ramps give off an odor because they're made of recycled rubber. As the ramps are exposed to the air and let in place for a while, the odor will fade. Compatible with B07D6BHG88, B07D6C9DD5, B002MY96WU, B01F9OPF42, B01KP4Q02M, B01KP4PY1U, B01KP4PZ14, B01KP5QLXO, B01KP5QH60, B01KP5QJLI and B07D6CGR75. The kerb ramp is used to provide vehicle access between the sidewalk and the street. Ideal vehicle access for playground areas, hospitals, public or private parking lots. Water flows easily under ramp and no piping required. Perfect solution for hand trolleys, golf carts, motorcycles and boats. If you have any questions about this product by SNS SAFETY LTD, contact us by completing and submitting the form below. If you are looking for a specif part number, please include it with your message.